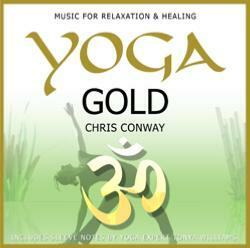 YOGA GOLD CD BY CHRIS CONWAY. "The perfect accompaniment to yoga, captures the flow and essence completely taking you on the ultimate yoga journey" Trish Smyth YFH RCYP - Yoga Teacher and Yoga Video presenter. Working closely with Yoga expert Tonya Williams, Yoga Gold is beautifully composed calming music for yoga by multi instrumentalist Chris Conway. Featuring real instrumentation of piano, flutes, acoustic & electric 9 string guitars, zithers, temple bells and gongs, Yoga Gold is a crafted musical journey that flows from track to track and becomes more peaceful as the album develops, mirroring a yoga session. Including personal notes by Yoga expert Tonya Williams and Chris Conway, this yoga album can also be enjoyed for listening pleasure, meditation, healing or just pure relaxation.